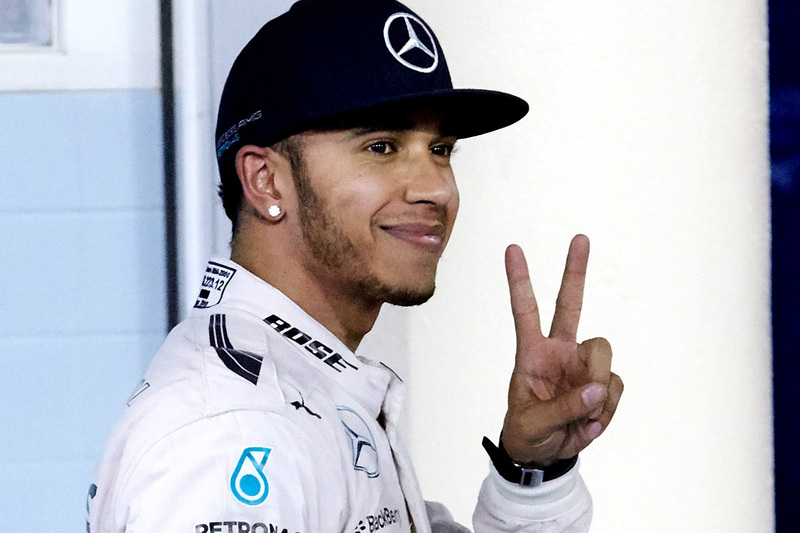 Lewis Hamilton has effortlessly converted his pole position into a race victory at the 2015 Bahrain Grand Prix. Hamilton was unchallenged for the bulk of the race while teammate Nico Rosberg lost time battling with the Ferraris of Sebastian Vettel and Kimi Räikkönen. “Firstly big thank you to my team,” said Hamilton on the podium. “The Ferraris gave us a real good run for our money. “It was really difficult to look after our tyres in these conditions. Hamilton’s only scare was a suspicious brake-by-wire system fault one lap before the end, but even that couldn’t undermine his efforts. The battle for second and third was a source of strategic and on-track action from the first lap after Rosberg lost his third place to an aggressive Kimi Räikkönen in the first sector. Rosberg, however, had a newfound sense of aggression himself and was pressuring the Finn to surrender the place by lap four. A late-braking move into the first turn was enough to get the job done, and the Mercedes driver successfully fought off a move from Räikkönen on turn four to seal the place. It took another four laps for Rosberg to catch Vettel, and with the Mercedes showing significantly greater pace in the first stint of the race, made short work of his compatriot on lap nine. The first round of pit stops shuffled the order in Vettel’s favour, but Rosberg again muscled his way past at turn one with a now-traditional gutsy braking move at the first corner. A three-peat was on the cards after the second round of stops, but an uncharacteristically untidy moment at the last corner sent Vettel wide and into the gravel, handing the position to Rosberg and damaging his front wing in the process, necessitating another trip to pit lane. Unseen by Rosberg, however — or perhaps Mercedes was just helpless to guard against it — was Kimi Räikkönen, who ran the counter soft-medium-soft strategy, opposed to the standard soft-soft-medium favoured by Vettel and the Mercedes cars. His pace on the medium tyre during the middle stint surprised even Ferrari, with the Finn’s pace on the harder tyre fast enough to reel in his teammate on what should have been the quicker rubber. Räikkönen gained at an average rate of half a second per lap on his teammate, and within 14 laps of his lap 18 pit stop the Finn was three seconds behind Vettel, triggering the German to make his second stop. So impressed were Räikkönen and his engineer with the pace of the medium, they argued over whether to readopt the soft tyre at all for the final stint, but Vettel’s gravel excursion and addition stop took him out of podium contention, leaving the Finn with nothing to lose either way. With the soft tyres bolted to the Ferrari by lap 41, he set about pulling himself towards the second-placed Rosberg. Within 10 laps he was within four seconds. Much as Rosberg gained his second place through a mistake, he lost second place by similarly missing his braking zone, handing Räikkönen an easy pass out of turn one. Räikkönen’s race was supremely controlled, earning him a certain nomination for driver of the day, with only Hamilton, who proved unreachable so late in the race with a 3.3 second buffer at the flag, having a smoother ride. “Obviously never happy to finish second,” said Räikkönen. “But after a difficult start to the year I’m pleased to get some results. Räikkönen paid tribute to his Ferrari team, which is making strides to close the gap to Mercedes after a huge leap during the off-season. “I’m very happy how the team is working,” he said. “Compared to last year, where we are now is a big step. Rosberg, who had taken a psychological beating from his teammate, the press, and the fans up until the race, drove solidly and will have expected more for his efforts — were it not for a similar brake-by-wire issue that opened the door to Kimi at turn one. “I tried to catch Lewis, but we were pretty similar [in pace], so I couldn’t catch him,” he said. “Then I lost my brakes in the end, so I lost my position to Kimi, which is very disappointing. “The overtaking was enjoyable,” he added, upbeat. “To overtake the red cars, I like that a lot. Valtteri Bottas spent most of his race on his own, again highlighting Williams as the third-quickest car, but no quicker. Vettel, however, gave Bottas some work to do in the final stint after the Ferrari driver emerged behind him after his emergency front wing change. The pair lost time battling with each other, but Bottas, with his Mercedes-powered car, refused to give up position despite his tyres being three laps older. Felipe Massa would have been expected to join in the fight, but a car problem on the starting grid forced Williams to start his car from the pit lane, leaving the two cars to themselves. Daniel Ricciardo, who was suffering through a similarly lonely race to Bottas, was told by his team that trouble was brewing ahead of him and began to close the gap to the warring drivers. It was in vain, however, with the gap too large to overcome in a single stint, and the Australian finished sixth. Romain Grosjean and Sergio Perez ended the race as racing islands — Grosjean ended 23 seconds behind Ricciardo, and Perez 17 seconds behind Grosjean — in places seven and eight. Daniil Kvyat drove a fantastic recovery race to finish ninth after qualifying seventeenth yesterday with a power unit problem. He spent the final stint battling with a stubborn Felipe Massa, who himself had an outstanding Sunday to recover from his pit lane start, with the pair taking home the last points of the race. Fernando Alonso came painfully close to scoring McLaren Honda’s first point since their reunion, finishing 3.9 seconds out of the top ten. Alonso drove as his usual gutsy self, but was helplessly mugged on any of Bahrain’s three straights by any and all challengers. Eleventh place was nonetheless significant in a race with few retirements — with the exception of his teammate Jenson Button, who failed to start with an electrical problem — and represents a relatively high note with which the team will start the European season, where it is due to introduce significant upgrades. Felipe Nasr took the title of rookie of the race in Bahrain from P12 after a race of fearless dicing in the midfield, including a bold move on Valtteri Bottas at turn 11. He was separated from his Sauber teammate Marcus Ericsson in P14 by Nico Hülkenberg, who himself finished just 1.5 seconds ahead of the Swede. Pastor Maldonado finished a disappointed P15 after his brakes failed and caught fire in the pit lane, but was fighting against the effects of a five-second penalty for starting the race from the wrong grid spot — he stopped in P18 despite qualifying in sixteenth place. Manor duo Will Stevens and Roberto Merhi brought up the rear of the finishers, with the Briton again leading the Spaniard home, in P16 and P17. Toro Rosso suffered a double-DNF after Carlos Sainz’s car stopped on track with a poorly-attached wheel and Max Verstappen suffered an engine-related failure, rendering his car “unsafe”. Jenson Button was the only other non-finisher by virtue of failing to start.